The client had acquired an apartment complex in Pennsylvania that had been part of a program for extremely large property managers. Being split off of a larger property group meant it no longer qualified for superior pricing; the premium was going to go up and the new owners knew it. Enter Robert (Bob) Sobel, Director of Sales, VP of Oxford Millin Insurance Agency, an agent for 33 years (17 with Oxford) who set out to find out how much more it was going to go up. At first it didn't look pretty. His best quote was nearly double what it had been. Then he read in ia magazine about the Habitational - Apartment Program from MiddleOak® on Big "I" Markets. He'd never used BIM before but gave it a shot. The responsiveness was "very good, very fast, easily handled, questions were minimal" and the "process was easy." The underwriters, Jacob and Rick, "were all over it," working hard to get Bob a quote back as quickly as possible. When it came in it was less than a 50% increase with "better coverage & limits in places," which made the client "very, very happy." Bob has already submitted a second quote request and plans more in the future. You can get this great level of service for your habitational risks as well. To qualify for the Apartment program the insured must own a minimum of eleven residential rental units, there is no maximum number of units or building/property size. Mixed Apartment/Office or Apartment/Mercantile and Mercantile lessors risk or Office Lessors risk occupancies, where the office or mercantile represents 15% or less of the total square footage. Outbuildings and appurtenant structures usual to dwelling and apartment living such as vehicle garages and storage facilities. Unless specifically outlined in the state-specific restrictions below, each state follows the general underwriting guidelines. The Habitational - Apartment Program and also the Habitational - Condominium Program from MiddleOak are available in AR, AZ, CO, DE, GA, IA, ID, IN, KY, MD, ME, MI, MO, MT, NH, NJ, NY, NV, OH, OR, PA, SC, TN, UT, VA, VT, WA, and WI on Big "I" Markets. Now that we've all enjoyed a star-spangled 4th of July celebration in honor of our country, it's time to turn our attention to an important non-insurance partner that can help you get free from the tyranny of endless filing. Unless you enjoy dealing with the stacks of paper involved with collecting signatures the old-fashioned way, you need to know about DocuSign. So what exactly is DocuSign? DocuSign is the leading eSignature solution in the market allowing easy, efficient, and secure signing of electronic documents. Accessible anytime, anywhere, on any device, businesses of all sizes and industries solve their paper problems by replacing manual, paper-based methods with DocuSign. It enables agencies to accelerate transactions to increase speed to results, reduce costs, improve visibility and control, and delight customers. 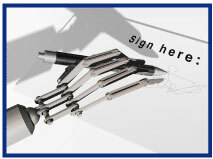 Want to see DocuSign in action? Visit www.docusign.com/IIABA to review your exclusive Big "I" member pricing (starting at just $192 per user annually) and to watch a short demo video. 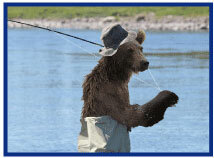 I was channel surfing not long ago and saw the movie title "Salmon Fishing in the Yemen." It sounded like a metaphor for futility such as "Cactus Harvesting of the Arctic" or "Deep-Sea Bear Hunting." It's about a Yemeni sheikh (Amr Waked) that has a dream of bringing the serene calm of salmon fishing to Yemen despite the obvious problem of introducing cold water fish to a desert river. The sheikh's dream is in the hands of a fishery expert (Ewan McGregor) who doesn't think it possible but is swept along by the politics of international goodwill. It's a sometimes funny, twisted love-story with an "impossible task" backdrop and assassination attempts. Fortunately for most private fishing clubs and lodges stocking rivers and lakes is less dramatic but a good way to keep their stock of high-quality fish, healthy and plentiful. You can take stock of Markel's Outdoor programs of Outfitters & Guides, Rod & Gun Clubs and Hunting & Fishing Lodges all of which involve fishing as well as hunting. 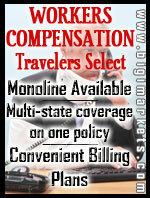 These outdoor insurance programs are available on a licensed and admitted basis in all states except Alaska and Hawaii. It's also not available in Yemen. 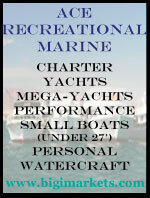 To further explore how your agency can take advantage of these markets, visit www.bigimarkets.com today! "Data Breach, The New Wild West? Cyber Risk Exposures and Insurance"
In 2014 the number of data breaches was widely publicized including online fraud, identity theft and business data breaches. Criminal hackers are no longer 'thrill seekers', but professional computer experts and criminals mostly located outside of the United States. Very few insurance producers have knowledge of the problems and possible solutions and this can leave them unable to discuss what steps (including risk management and insurance coverages) need to be pursued. This webinar will explain first and third party exposures to various cyber risks, the lack of insurance coverages in current CGL and property policies and the emerging markets for this coverage. Other upcoming VU webinars include Beyond the Basics: Emerging Issues Personal Lines Issues and Certificates of Insurance - 2015 Edition. VU webinar questions can be sent to bestpractices@iiaba.net. For all you folks who recently registered for Big "I" Markets, remember you can participate in a webinar from the comfort of your office to help you learn how to navigate around the system. Every Thursday at 2:00 p.m. EDT we'll show you how to navigate the Big "I" Markets platform, including how to submit a quote! A recording of this webinar can be found under "Publications" after logging into Big "I" Markets. 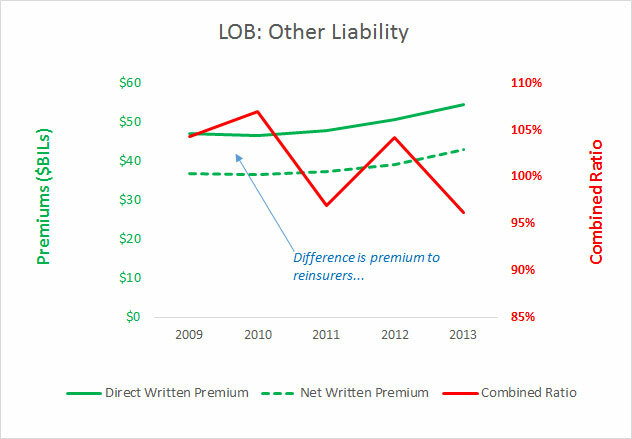 The Insurance Expense Exhibit and other portions of the "Convention Blanks" or "Yellow Books" require insurers to provide information on 35 Lines of Business or LOBs. 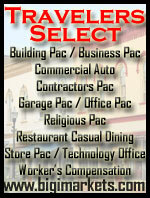 One that is near and dear to your national and state associations is Other Liability. 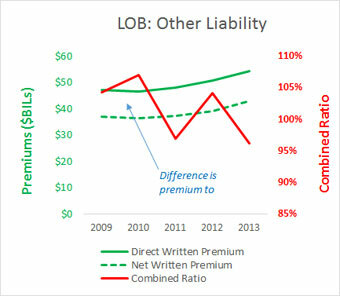 It is about 10% of total industry premiums and about 20% of all commercial lines written. 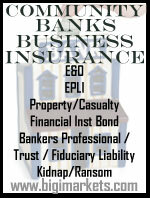 This LOB consists of not only errors & omissions, like your own insurance agency E&O policy, but also all other professional liability, environmental/pollution, excess/umbrella, liquor liability along with a host of unusual liability-only policies on things like escalators, contractual liability and completed operations. The line can also be broken out between Occurrence-based and Claims-made. One important coverage area is treating separately and that is medical professional liability. Below is a graph of the particulars on the total LOB for the past five years, excluding medical professional but including both Occurrence- and Claims-made coverage. Congrats to our agent in Arkansas on a habitational apartment sale of $56,259 in premium!